In this tutorial, we will learn the session management technique. There are 4 techniques to manage the session in servlet. Here we will discuss the first techniques to manage the session. Cookie class is the first technique to manage the session. Before discussing Cookie class in detail let's first understand about the cookie. Cookies are the small files that are stored in cache memory of your computer browser so that your browser and websites can track your browsing session and save certain useful information, such as account name and password for later retrieval. Cookies data are stored in the client browser. Because a cookie value can uniquely identify a client, cookies are often used for session tracking. 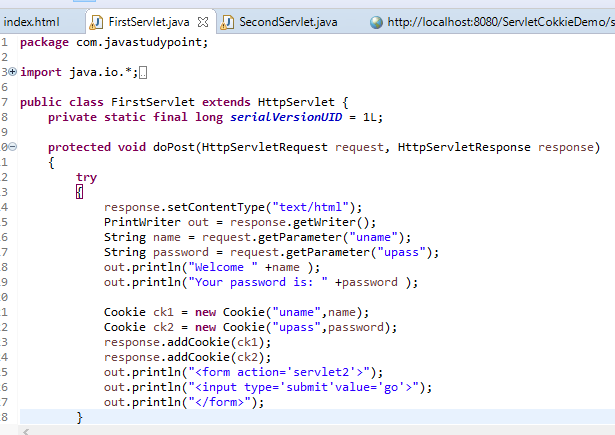 The servlet API provides the javax.servlet.http.Cookie class for working with cookies. You create a cookie with the cookie() constructor. 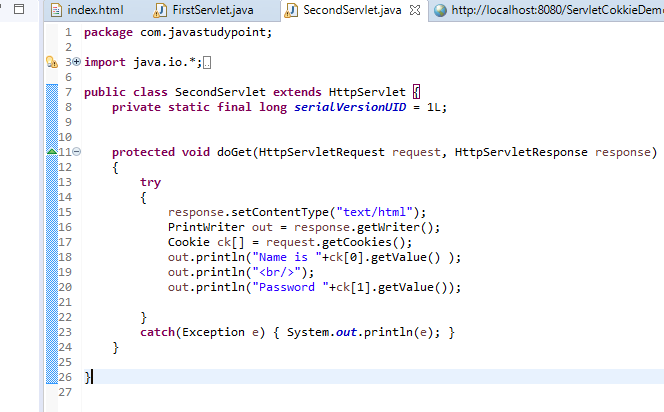 A servlet can write the cookie to a user's machine via the addCookie() method of the HttpServlet Response interface. The data for that cookies are then included in the header of the HTTP response that is sent to the browser. The name and the values of cookie are stored on the client browser. The information that is saved for each cookie includes the following. A servlet can write the cookie to a user's machine via the addCookie() method of the HttpServletResponse interface. A servlet retrieves cookies by calling the getCookies() method of HttpServlet Response. It sets the maximum age of the cookie to secs. This is the number of the second after which the cookie is deleted. It sets the comment field of the cookie. it sets the cookie protocol version to v which will be 0 or 1. It returns the name of the cookie. it returns the path of the cookie. It returns the age(in seconds). 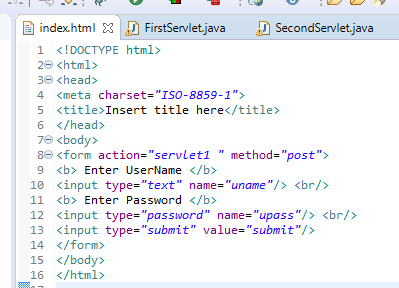 In this example, we are storing the username and password in the cookie object and accessing it in another servlet.